The Leap Joy Dunk Tank can be set up virtually anywhere. With our Dunk Tank, we just dolly it in and set it where you like! The solid aluminum construction makes it safe against those fast flying balls! Our tank can be filled in 30 minutes or less and even has a window to see inside the tank. 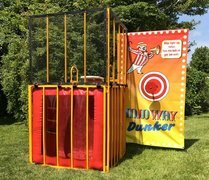 The Leap Joy Dunk Tank is great for any gathering, corporate event, family reunion, church function, and event fund raiser.